Take a culinary tour of Central America and go in depth about the traditional dishes in Costa Rica. If you're traveling to Costa Rica for the first time, you're probably curious about what Costa Rican food is all about. Fortunately, food in Costa Rica isn't that different from food in the United States – with a few notable exceptions. A typical Costa Rican breakfast consists of gallo pinto (a tasty combination of rice and beans), scrambled or fried eggs, cooked plantains, tortillas and/or toast. In restaurants, it is usually served with orange juice and coffee. Most menus include variations on the above; for example, onions and tomatoes stirred into scrambled eggs. 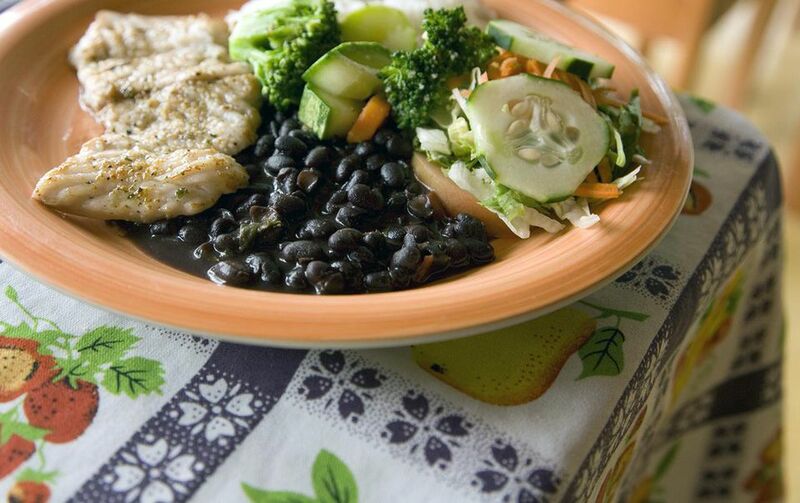 One of the most traditional Costa Rica dishes is called a casado: like a typical breakfast, the meal is a mix of items like black beans and rice or gallo pinto. However it also includes fried plantains, a chunk of Costa Rican cheese, salad, and a meat item, usually fish, beef, or chicken. Casados are normally served with tortillas for wrapping. Other popular Costa Rica meals that you will find in most eateries are black bean soup (sometimes served with a hardboiled egg), heart of palm salad, and seafood in any form. American snacks such as Pringles and Doritos can be found pretty much everywhere in Costa Rica. But there are also some strange and unfamiliar flavors you should try. Ceviche: Chopped raw fish, shrimp, or conch mixed with onions, tomatoes, and cilantro, and marinated in lime juice. Served with fresh tortilla chips. Popular in every coastal region. Chilera: A spicy dressing made with pickled onions, peppers, and vegetables. Tres Leches Cake (Pasel de Tres Leches): A cake soaked in three kinds of milk, including evaporated milk, sweetened condensed milk, and cream. This cake is meant to be served cold. Arroz con Leche: Rice soaked in warm milk with sugar, cinnamon, and other spices. Also known as Costa Rican rice pudding. Flan: A soft caramel custard. Orange custard is another popular dessert. It is commonly soaked in caramel. Refrescos: Fruit smoothies made with water or milk (leche). Called "frescos" for short. They are normally prepared with cold fruit. They are great on a hot day. Agua dulce: Water sweetened with sugar cane. A common drink for kids. Guaro: A fiery sugar cane liquor, served as a shot or in a cocktail. A must if you go out partying. Beer (Cerveza): The national beer of Costa Rica is Imperial. Other brands are Pilsen (a pilsner) and Bavaria. Costa Rican food is pricier than that of other nations in Central America. This is the most expensive country in the region. However, it is still quite cheap. It's really just a matter of context, as most Costa Rican meals generally range from $4-8 USD and are far cheaper if you dine local. Costa Rica's comida tipica, or native cuisine, is simple but tasty — just walk up to the counter in any corner café, or soda. This article has been updated by Marina K. Villatoro.